If you’ve read the survey we did July 2010 in www.RVtravel.com, you know that 21% of RV owners who responded have been shocked by their vehicle. Review the 21% report at http://new.noshockzone.org/15/. What follows is #8 in a 12-part series about basic electricity for RV users and how to protect yourself and your family from shocks and possible electrocution. In addition, this series could protect your RV’s appliances, entertainment systems and computers from going up in smoke. No it’s not the name of an insurance company or a European sports car, GCFI is an abbreviation for Ground Fault Circuit Interrupter or G-F-C-I. They’ve been required in many localities for electrical outlets located near sinks or the outside of your house for the last 10 years or more. 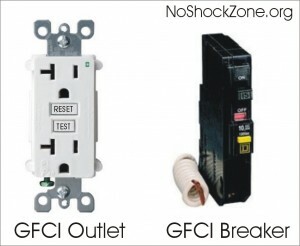 The two types of GFCIs you’ll encounter are either built into the power outlet itself (left in the illustration) or inside the circuit breaker at the power panel (right in the illustration). Both do exactly the same thing: they watch for electricity that’s going someplace it shouldn’t in an electrical Circuit by way of a Fault to Ground and then Interrupt the flow by tripping the circuit breaker. Rearrange the letters and you get G-F-C-I for Ground Fault Circuit Interrupter. That’s how the name is derived. Well, if you’ve been reading along from Part I of this series, you’ll know that your heart muscle is very sensitive to electrical shock. While it takes around 8/10ths of an amp (800 milliamperes) of current to power a 100-watt light bulb, it takes less than one percent of that same current (10 to 20 milliamperes) to send your heart into fibrillation, causing death by electrocution. That’s why the NEC (National Electrical Code) now requires a special type of circuit breaker for damp locations that can tell the difference between the normal currents feeding an electrical appliance and the currents accidentally flowing through you to ground. And while a GFCI sometimes trips unexpectedly, it’s really there to save your life and the life of your appliances and other electrical components. It’s a pretty ingenious system that uses a small current transformer to detect an imbalanced current flow, so let’s use our water pump analogy to review the typical current path in a standard electrical circuit. As you can see from the illustration, we have our pump and turbine system again. And let’s imagine the pump at the top is pushing 7 Gallons Per Minute (GPM) of water current around in a circle that our little turbine at the bottom is happily using to spin and do some work. I’ve added flow meters at the bottom left and right of the illustration so we can keep track of these currents. Now since our pipes have no leaks, the current going out of the pump from the black pipe will exactly equal the return current coming back in the white pipe. And this will be an exact balance since no water is lost in this closed loop. That is, if 7.000 GPM (Gallons Per Minute) of water are flowing out of the black pipe, then 7.000 GPM will be returning to the pump via the white pipe. There are no water losses in this perfect system. Let’s add an extra meter in this system so we can keep track of the water flow a little easier. Notice there’s now a center meter that will show you the difference in flow between the other two meters. If the left and right meters show exactly the same water flow, the center meter will show zero GPM of flow by centering its needle. This is exactly what should happen in an electrical circuit that’s working properly. That is, if a light bulb has exactly 1 amp of current flowing out from the black (hot) wire, then exactly 1 amp of current should be flowing back in the white (neutral) wire. And an electric griddle that has 10 amps of current flowing out the black wire should have exactly 10 amps of current flowing back in the white wire. If there’s nothing wrong in the light bulb or griddle circuit, this electrical current balance will be pretty close to perfect, out to at least 3 decimal places. That is, 10.000 amps of current flow going out will equal 10.000 amps of current flow coming back in. Now I’ve added a leak in the black outgoing pipe via the red pipe sticking out to the left. You can see from the red pipe’s meter that 5 GPM of water is flowing out onto the ground. And since only 7 GPM of water is coming out of the black pipe on the pump, there can be only 2 GPM of water returning into the white pipe on the right. Those 5 GPM of imbalance show up in our center balance meter, which alerts us to the fact that there’s a leak somewhere in the system. Now, we really would like to know about small leaks as well, so that center meter will tell us about an imbalance down to very small drips, say less than 1/1000 of a GPM. The same is true of our electrical circuit where we’re interested in currents in the 1/1000 of an ampere range (1 mA or 1 milliampere). That’s because just 10 to 20 milliamperes of misdirected current flow is close to the danger level for stopping your heart. In an electrical system, a similar type of detector is used at the center of the circuit which is acting like a balance beam. So if 7 amps of current shows up on both sides of the balance, then the beam will be exactly level. However, put 7 amps of current on the left side and 2 amps of current on the right side, and that 5 amps of imbalance will tip the scales, just like the teeter totter ride you took with your dad when you were maybe 50 years younger and a 150 pounds lighter. In our GFCI circuit this is a much more sensitive balance beam that only needs 5 mA (5 milliamperes or 0.005 amps) of current imbalance to tip over rather than the 5 GPM we’ve shown in the water pump illustration. The reason for needing this much sensitivity is that our hearts can go into fibrillation from just 5 mA of AC current flow, so we would like to detect and stop that flow before it stops your heart. So here’s where it all comes together. Notice that our guy is unwisely touching a hot wire with a hand while his foot is in contact with the earth. And while the electrical outlet might have been supplying 7.000 amps of outgoing current to an appliance with exactly 7.000 amps of return current, there are now 7.005 amps going out and only 7.000 amps coming back. Those extra 0.005 amps of current (5 milliamperes) are taking a side trip from his hand to his foot via the heart. And the current balance circuit inside the GFCI is sensitive enough to recognize that imbalance and trip the circuit open with as little as 5 or 6 milliamperes of current flowing someplace it shouldn’t be going. The click you hear when a GFCI trips is its spring loaded contact opening up and interrupting the current flow in the circuit before it causes electrocution. That’s the entire GFCI’s reason for existence, to save you from electrocution and keep your RV’s electrical system safe from damage. Pretty cool, eh? Also note that the GFCI doesn’t really need a direct ground connection via the ground wire to do its job. Yes, one is required to properly “earth” the entire circuit, but the current balancing act is only between the black and white wires going to the outlet. If the current flow in the white wire exactly matches the current flow in the black wire to within 5 mA (milliamperes), the circuit stays activated. If the current flow is unmatched by any more than 5 mA, say by someone touching a live wire and the earth at the same time, then the trigger circuit inside trips a little switch and the current flow is stopped. It’s that simple. All this means you should install GFCI breakers where required, and don’t remove or bypass them if there’s false “nuisance” tripping. That so-called false tripping hints there’s something else wrong in your RV electrical system that’s leaking out current to someplace it doesn’t belong. And fixing that electrical leak is important since if you get your body in the middle of the current leak it can shock or even electrocute you. Part IX of this series will cover why false GFCI tripping occurs and how to troubleshoot for it, so come back next week. See you then. Thank you for sharing this. We’re always looking for valuable resources to send to clients and my colleagues, and this post is definitely worth sharing. Dang Mike… The more of this I read the more I agree with you. I often use the Teeter Totter example for describing how a GFCI works in fact. I am a certified Electronics Techinician, And Extra Class Ham Radio Operator by the way. Fully trained in CPR with or without AED, Retired after 25 years of telling cops where to go (police dispatcher). and now a full time RVer. So far I do on-line research for the fun of it and thus have managed to pick up quite a bit above and beyond the classroom.. YOUR pages are going in my reference file cause.. you are doing a great job here. Yes, the teeter-totter example really explains how a GFCI works. GFCI theory should be a simple concept, but I’ve met dozens of electricians and inspectors who have no clue as to how they really work. And the general public has no simple explanation of how they work either. I hope these articles are clear enough for everyone to grasp the concept. I appreciate your feedback. Yes, I think that AFCI’s are potentially a great upgrade in a motorhome. As you’re probably aware, and ACFI’s job is to shut off power to an electrical arc that can cause a fire. And I think there’s few things more terrifying than a fire in an RV. However, note that you’ll also need GFCI protection for exterior outlets as well as bathroom outlets. I’m not sure of the RVIA’s opinion on how this should be accomplished, but I’ll check with my connections and post more info on your question later. Mike, thank you for posting such good information, very useful. The one thing that I do not have clarity on is having multiple GFCI devices in the same circuit. You can see how this can happen particularly in an RV where the breaker panel has GFCI breakers and then you plug into a outlet that also has a GFCI breaker. On the various RV forms you see the subject come up quite regularly, is it a certain brand or the age of the GFCI breakers that will cause this problem. Thank you for any insight you may have on this. Bill, I’m thinking about how two GFCI breakers in-line on a common circuit could interact, but according to my mental picture they shouldn’t even know the other one is in the circuit. And I don’t think that tripping one with the self-test button should even trip the other one. There’s no external fault path to unbalance the circuit and activate the trip circuit. That being said, I’ve never tried this experimentally, so maybe there’s something going on that I’m missing. What exactly are you (they) seeing as a problem? More random tripping? No tripping during a fault? Something else I’m missing? I’m setting up a big GFCI bench experiment in two weeks for a guitar grounding system, so I’ll add another GFCI in-line for the experiment and see if they will interact or fail somehow. What is the actual components that measure a miss balance of amperage. In that most components work on voltage pressure, how do we get to amperage miss balance? That’s an easy one. It’s a simple transformer with both the neutral and hot wires passing through it. Since the outgoing current on the hot wire should match the return current on the neutral wire, under normal conditions the two magnetic fields will cancel each other out. But if there’s an imbalance in the currents because some of it is leaking to ground, then the transformer’s secondary will produce an output voltage which is used to trigger the GFCI trip circuit. The GFCI discussions always seem to rotate around what would have to be shore power applications as they reference the hazard as being connecting to earth ground. How will the GFCI work to protect you when you are on inverter or generator, where all the AC (hot neutral and ground) is supposed to be isolated from the chassis and DCand there is no earth ground? Also in the mix is that the neutral and ground in the inverter or generator may or may not be bonded, and no bonding is allowed anywhere else in the van. OK, let’s make sure we all know the difference between grounding and bonding. The problem is that the word “grounding” is used for lots of electrical connections that have nothing to do with being connected to the “earth” which is the dirt beneath our feet. Bonding is an electrical connection (bond) between the current return path (the Neutral) and the local chassis “ground” (frame of your generator, chassis of your vehicle, etc…). GFCI’s work by sensing any difference between the outgoing current on the hot wire and the return current on the neutral. If there’s any leakage between the hot and neutral or ground (the earth), then it will sense that difference and trip the internal relay. That suggests that the GFCI needs a complete circuit in order to trip, and which is indeed the case. When you’re running on generator with a bonded neutral and get between a hot wire and the chassis of the RV, then that imbalance occurs between the hot and the chassis, and the GFCI trips. But since the entire RV’s electrical system is floating above earth potential, if you get between a hot wire in the RV and the earth, no fault currents will flow and the GFCI won’t trip. Contrary to what you may read from wannabe electricians, all 120-volt AC systems really want to be neutral-chassis “bonded”. If running on generator to a single distro point (your RV) then you don’t require an earth ground. But if you’re connected to shore power, then you also need a bond to the service panel’s “ground” which is indeed connected to the earth “ground” via a ground rod. Don’t feel bad if this is all confusing, since many electricians and even electrical engineers don’t understand all this. But if you remember that generator neutral-chassis bonding is always a good idea, and generators don’t require grounding to earth when powering a single device, your GFCI’s will work when required. And when connected to shore power, your RV must be bonded to your home or campground service panel “ground” via your extension cord’s EGC (Equipment Grounding Conductor) ground wire. Also, know that a ground rod connected to the chassis of your RV really doesn’t “ground” your chassis. That requires the previously mentioned “bond” to the service panel Earth-Ground-Neutral connecting point. Thanks for the details, very helpful. You mentioning that getting between the hot on vehicle and earth ground would not trip the GFCI, which makes sense from a complete circuit standpoint, but would you get shocked? I have our new battery and inverter/charger setup on the bench right now, testing before I install it into our class b RV. The inverter/charger does an automatic neutral bonding when it is inverting. The whole setup is isolated from earth on the bench. When inverting off the batteries, I see 75 volts between the hot from the inverter and earth ground measured to a piece of earth ground rigid conduit that is on the shop wiring. I have no good way of measuring how much current this could supply, but would assume it could be enough to be a hazard as it is a 100 amp inverter. It is common t hear folks say that got shocked from the RV to earth when on inverter, but I never could figure out how it can happen do to the no complete circuit idea. Is this some sort of capacitance thing? I don’t see any voltage to earth ground from the 12 volt DC batteries. If you park an ungrounded RV anywhere underneath high-tension power lines (those big things with 250,000 to 500,000 and up to one million volts) there will some sort of capacitive or inductive couping between the overhead wires and the frame of the RV. Since your RV isn’t earth-grounded, then it’s own potential can be elevated up to 10,000 volts above earth, but at really low current. However, while not deadly it can be really painful. I’ve talked to a few Power Company engineers about this, and they’ve meaured up to 5mA of current at 10,000 volts if you have a 40 ft RV parked in parallel with the lines which are hanging at their minimum 28 feet abouve the road. That’s like grabbing a spark plug on a running lawn mower, which is VERY painful. I’ve received a number of emails on this subject, and have discovered that some campgrounds actually put their dump station right under these power lines. So if you were touching a water valve and the side of your RV at the same time you could get a really good shock, even though your RV isn’t connected to any power source and the generator is off. Next, it’s rare that the neutral and ground connections on a shore power supply will be at exactly zero volts due to normal voltage drops in the neutral upstream of your shore power connection. Code implies that this could read up to 3 volts AC and still be in compliance. In fact, if you DO read 0 volts between neutral and ground on a circuit with a load, you can be pretty sure there’s a bootleg ground upstream. I use a 600/1200 watt spake heater to provide current loading for my ground loop tests. So yes, it does sound like your inverter would tolerate a G-N bonding plug since it has a floating neutral. My point is that a lot of them do the 60/60 volt output which makes measurements a little more tricky. BTW: This sort of troubleshooting is exactly what I plan to teach in my No~Shock~Zone RV technician classes if I can ever get a manufacturer to pay for it. Sadly, you seem to be way better at measuring voltages logically than most electricians and technicians I’ve conferred with on electrical troubleshooting. So, if we go to a bottom line type guess—do you think the 75 volts that I measure between the hot output of the inverter in the RV to earth ground would have enough current available to do personal damage to anyone? Of course, the only way it could happen would be if you had a short between the hot and the RV body from a bad wire or appliance, and also not have the correct AC ground to body and a bonded neutral in the inverter. I mention the scenario because there seem to be lots of folks that have inverters and don’t know if they are bonded or not, and don’t think that GFCI is not needed. If the inverter can cause the body of the RV to go hot compared to earth ground in those cases, there could be a big hazard if enough current is available. Log in | 63 queries. 0.577 seconds.